As a tester for the italian version of this pattern, I really enjoyed the project! 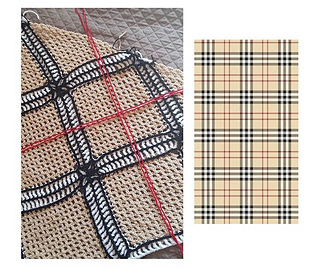 My intention is to reproduce something like the Burberry tartan pattern with my colors choice, hope it works! Siol will be released as a Mini CAL in 3 parts, and it will be available in 13 languages (italian included). The CAL will starts on April 25 in Iman’s Facebook group HaakSteek. After the last part is released there on May 23rd, the complete pattern will be available on Ravelry as well. Enjoy us and have fun!